Patient John Williamson, Nurse Unit Manager Ajith Rajagopal and St John of God Mt Lawley Hospital CEO Chris Hanna. Picture: Supplied. ST JOHN of God Mt Lawley Hospital is celebrating a milestone birthday this month. Its Restorative and Day Therapy Units have been running for 21 years, with both providing aged care rehabilitation for older people in the inner and eastern areas of Perth with funding from the Health Department. Nurse unit manager Ajith Rajagopal celebrated the occasion with current patients and caregivers. “It’s a coming of age for the units, as we are considered a new service compared to the rest of the hospital that commenced caring for patients in the 1930s,” he said. The Restorative Unit is a 24 bed inpatient facility that helps patients recover from injury, illness or surgery, with patients transferred from Royal Perth Hospital, other hospitals or referred via their GP. The Day Therapy Unit is an outpatient facility with services for older people, spanning geriatric medicine, falls, cognition and memory, Parkinson’s disease and more, with patients able to be referred to the free service via their GP. 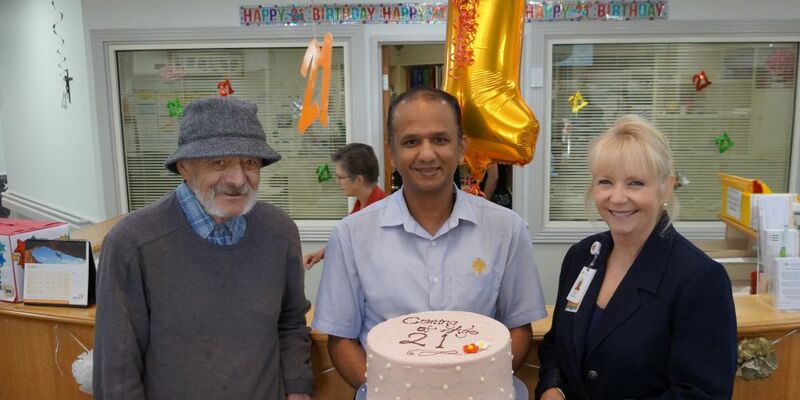 “Our Day Therapy Unit is especially important to the local community as it allows older patients to stay in their homes or care facilities while still receiving important in-hospital clinical care,” Mr Rajagopal said. If you are interested in learning more or know someone who could benefit from the service, call 9370 9000.